I don’t tend to share a lot of my kids’ school work, besides maybe Thalia’s awesome letter to her teacher on why you should reveal the baby’s name when you’re pregnant which was too fun to keep to myself. (Follow up: The baby is here, he’s named Jack, and I bet more than a few girls are disappointed that she didn’t choose Christophe.) 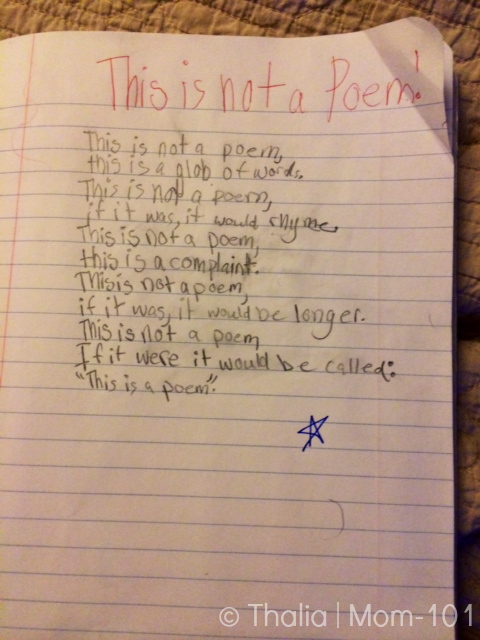 But this week, Thalia had a free writing assignment for homework, and she decided to write a poem, starting by calling it This is Not a Poem. this is a glob of words. if it was it would rhyme. if it was it would be longer. If it were it would be called “This is a poem”. Try evaluating that on some common core standardized test, Pearson. She’d probably have failed because it didn’t rhyme and the last period was outside the quotation marks. I must say there’s something both scary and wonderful as a writer, to see something your eight-year-old wrote that you wish you did. . Older: Parents: You’re all doing it wrong. I loved it. Children are so gifted. They write the truth, so easily. How do we lose that? Oh thank you Alexandra. You put it perfectly. She is so proud. And I get to be annoyingly proud of her right back. 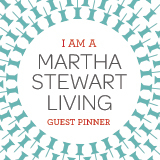 So glad I stopped to read this on a crazy hectic week – totally loved it. That’s brilliant! Thank you so much for sharing it. Easily the best thing I’ve read this morning. Ha, Korinthia! I brought out that very painting (well, a photo of it online) and we talked about how creative it was because we see a pipe, but the artist wanted you to see the whole painting. Of course it doesn’t look like any pipe they’ve ever seen so that may have threw them, ha. Brilliant! It’s a perfect mix of defiance and rhythm. Sign her up for the Surrealist art group! Wow, you have a brilliant writer on your hands. It’s incredible, on so many levels. You didn’t write it, but you made her with the core of yourself. What a beautiful thing, the way they take what we give and what we expect and turn it all into something so much more amazing than we could have ever imagined. ‘This is a glob of words’ might just have made my day. Love it. And just to say, full stops belong outside the quotation marks where I’m from. Emma recently posted..Valium. I need valium. LOVE THIS! As a poetry lover and writer, this blew me away! That is the exceptional writing from an eight year old. She has a great vision, it made me feel good after reading the so called, not poem. Coming from a child so small, this piece is an example of excellence and simplicity. Enjoyed a lot.